SOME 120,000 sticks of cigarettes. That is my conservative estimate of how many cigarettes I have smoked since I started smoking 34 years ago. By conservative I mean 10 sticks a day, a figure that is half of what I used to smoke for a large chunk of those 34 years. A pack of Dunhill 20’s was only RM2 when I started smoking. Yes, it was that long ago; 1985 to be precise. Biology was a favourite subject at school and I had no problem memorising some of the 4,000 harmful chemicals the textbook said were in a puff of cigarette. Nope, knowing and memorising the list did not deter me from smoking. Even if the biology textbook had listed 40,000 harmful chemicals the result would have been the same. My smoking habit that is, not my ability to memorise the list. Why? Maybe because I felt invincible and eager to rebel against the establishment, that’s why. Silly, but that was how my 16-year-old teenage brain thought. It has now been two months since I last smoked a cigarette, and unlike my previous attempt at phasing out (I hate to use the word quitting because I am not a quitter) cigarettes from my life, this time I do not have any urge to smoke. The difference this time is that I am undergoing a stop smoking programme under the Pusat Kesihatan Universiti of Universiti Malaysia Terengganu. I’ve stopped smoking but I am still on nicotine, the substance that causes dependence or addiction in tobacco. Instead of cigarettes, I now get my dose of nicotine from nicotine gum. And I suffer no withdrawal symptoms. One of the most important things to ensure a better chance of forgetting cigarettes as a smoker’s source of nicotine is not to underdose the nicotine gum and other nicotine replacement sources. That is why a heavy and long-time smoker like me would usually be prescribed nicotine gum containing four milligrams of the addictive substance, about three times the amount contained in a stick of cigarette. Immediately after I popped the first nicotine gum I felt no urge to smoke, even when I went out riding or had teh tarik with my biker friends. Nada, zero, zilch. There was no need to smoke because my body’s craving for nicotine has been fulfilled by the nicotine gum. Besides, I had psyched myself up that I wanted my lungs back. I am figuratively, literally and physically tired of having to catch my breath after just a bit of strenuous physical exertion due to the high content of carbon dioxide in my lungs (17 parts per million when I first joined the programme). When friends offered me a cigarette, I countered by offering them my nicotine gum. Now not only have they stopped offering me cigarettes but some of them are also considering following in my footsteps because the nicotine gum provides more nicotine than a stick of cigarette. I am just a year shy of reaching the half-century mark in age but I have friends who are young, single and eligible for the Bantuan Sara Hidup (BSH). 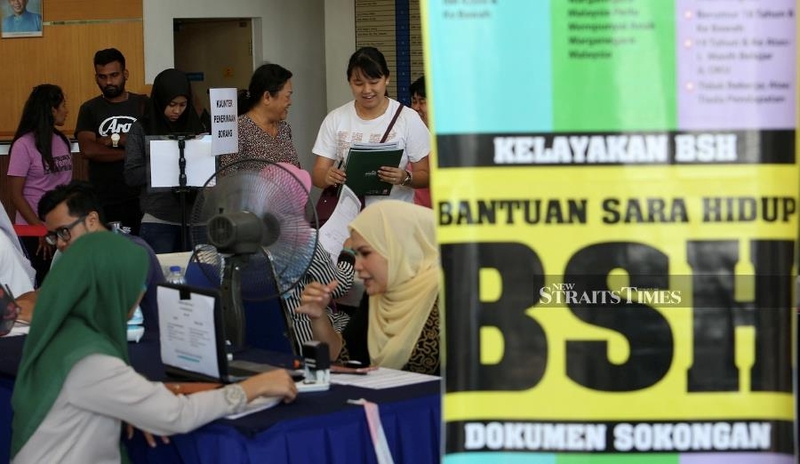 They have jobs but their income is barely enough for them to get by and after years of receiving Bantuan Rakyat 1Malaysia (BR1M), the precursor of BSH, from the Barisan Nasional government, they have become somewhat dependent on it. This is similar to how I became dependent on nicotine after decades of inhaling tobacco smoke whenever I was nervous, jittery or stressed. Unlike me who can easily forget my clove cigarettes because I got three times the nicotine dosage from a single nicotine gum, my young friends cannot help but be reminded of the old government as the RM100 BSH they now receive is less than a quarter of the BR1M handout they used to get. A journalist friend lambasted the government’s decision to give the RM100 handout. He argued that it just promotes dependency and a repeat of the old system. On a few occasions when I ran out of nicotine gum, I still turned down offers of cigarettes because I do not want to go back to having wheezy lungs. The benefits of not smoking far outweigh the kick afforded by nicotine, so I am well on my way to becoming totally free from nicotine addiction. However, the same cannot be said for those who depended on BSH and subsidies to stretch their meagre income to match the rising cost of living. As Finance Minister Lim Guan Eng said recently, the re-implementation of Sales and Services Tax (SST) was not a guarantee against price hikes and the government had never given such a guarantee. In other words, there is little the government can do to curb the rising cost of living and the lower income rakyat must figure out how to cope with the resulting economic hardship on their own. Of course, it is not wise to make the rakyat too dependent on cash handouts, but unless the reduction of cash handouts is balanced with a better life and a rosier economic outlook, pursuing that course of action will only alienate them further from the government. And we cannot blame them if they start craving for the old system they ditched a year ago.